Dr. John Day is a cardiologist and Medical Director of the Intermountain Heart Rhythm Specialists in Salt Lake City, Utah. He received his medical degree from John Hopkins and completed his residency and fellowships in cardiovascular medicine and cardiac electrophysiology at Stanford University. Jane Day is his wife and co-author. 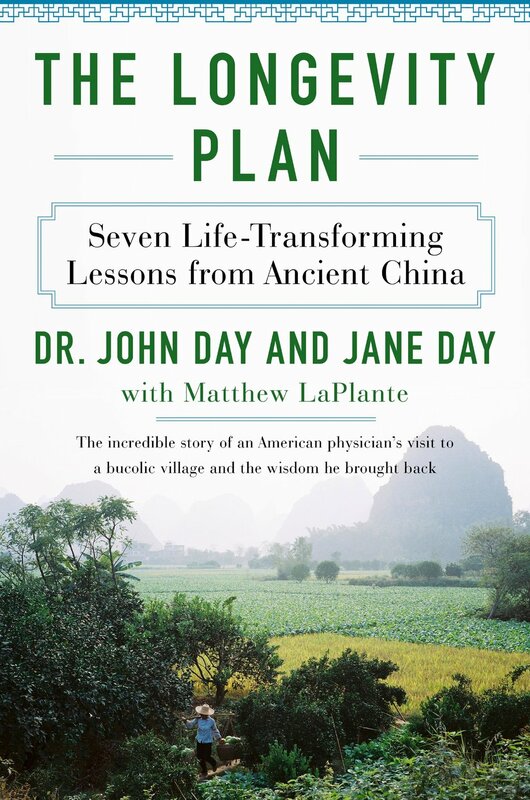 From a renowned Johns Hopkins- and Stanford-educated cardiologist at Intermountain Medical Center—a hospital system that President Obama has praised as an "island of excellence"—comes the story of his time living in Longevity Village in China, and the seven lessons he learned there that lead to a happy, healthy, long life. At forty-four, acclaimed cardiologist John Day was overweight and suffered from insomnia, degenerative joint disease, high blood pressure, and high cholesterol. On six medications and suffering constant aches, he needed to make a change. While lecturing in China, he’d heard about a remote mountainous region known as Longevity Village, a wellness Shangri-La free of heart disease, cancer, diabetes, obesity, dementia, depression, and insomnia, and where living past one hundred—in good health—is not uncommon. In the hope of understanding this incredible phenomenon, Day, a Mandarin speaker, decided to spend some time living in Longevity Village. He learned everything he could about this place and its people, and met its centenarians. His research revealed seven principles that work in tandem to create health, happiness, and longevity—rules he applied to his own life. Six months later, he’d lost thirty pounds, dropped one hundred points off his cholesterol and twenty-five points off his blood pressure, and was even cured of his acid reflux and insomnia. In 2014 he began a series of four-month support groups comprised of patients who worked together to apply the lessons of Longevity Village to their lives. Ninety-two percent of the participants were able to adhere to their plans and stay on pace to reach their health goals. Now Dr. Day shares his story and proven program to help you feel sharper, more motivated, productive, and pain-free. The Longevity Plan is not only a fascinating travelogue but also a practical, accessible, and groundbreaking guide to a better life. Matthew LaPlante teaches news writing, crisis reporting, and feature writing in the Department of Journalism and Communication at Utah State University. A career journalist who has reported from more than a dozen nations, his professional work focuses on international crises, military issues, science, and sports. His work for publications including The Washington Post, The Los Angeles Daily News, CNN.com, MLSsoccer.com and The Salt Lake Tribune is chronicled at mdlaplante.com.